The venison stew was one of the dishes I was most looking forward to making for my Highgarden-themed Game of Thrones season 6 finale dinner, which was based on the above passage from A Clash of Kings. I haven’t had a good excuse to cook venison before, and incorporating trenchers seemed fun and memorable. On a graduate student budget, located in the Bay Area, the only available option for venison was frozen and ground. This presented a challenge; while the book description specifies that the venison is stewed, the long cook time of a stew isn’t likely to improve lean ground venison. If I had some other cut more appropriate for stewing, this recipe would be quite different! I adjusted by “stewing” the venison for only a few minutes in the beer and barley mixture to prevent it from becoming too tough. I also attempted to keep to a medieval pantry, excluding additives like tomatoes. While many of the other medieval stew recipes I’ve seen impart flavor with heavy quantities of spices, I wanted to make sure the lighter and unusual (to my palate at least!) taste of venison was not overpowered. There’s a fairly gentle blend of flavorings used here, which work together well and allow the venison taste to shine through. I ended up using nearly two full bottles of beer. One was a lightly spiced winter ale and one was a very smooth stout, since that was what I had on hand. I would avoid bitter or sour beers. You can also use stock or bouillon to replace some or all of the beer liquid volume, although you may need to adjust the salt balance. I used hulled barley, not pearled barley. Hulled takes longer to cook but retains more of the highly nutritious parts of the grain. Adjust your cooking times accordingly! Pearl onions impart a lovely sweetness and juicy texture to this dish. I peeled fresh ones, but it is time consuming and not really worth it if you’re not fond of doing finicky stuff like that. If you’re up for the challenge, this guide is pretty good. Rosemary and/or savory would also work nicely here. I love brandy for deglazing – it adds a really nice complex sweetness. You could also use sherry, or just exclude and use the beer. Heat up a dutch oven over medium heat with a little bit of oil – just enough so that the bacon doesn’t burn before the fats drips out. Fry the diced bacon until the fat is released and the bacon gains some color. Remove the bacon bits and set aside. Add the diced onions and sprinkle on some salt. Fry them until softened. Add the carrot. Fry both until the onion are golden. Turn the heat off, and add the brandy. Use your spatula to scrape up all the colorful bits stuck to the pan. Add your 1 cup uncooked barley and toss with the rest of the contents of the pan. Add your beers and stock/bouillon if using. You will need at least 3 cups of fluid total, but you should monitor it to make sure you don’t boil off too much liquid. Add the fresh-cracked black pepper, thyme, bay leaf and your pearl onions. Simmer all this for 30 minutes or so, until the barley is nearly done (depending how soft you like it). Stir it regularly to prevent it sticking to the bottom of the pan, and check on the liquid level. You don’t need all the liquid to boil off since it is supposed to be more of a stew. Test for salt and add more as necessary. While you’re waiting on the barley, heat another skillet with 1-2 tbsp cooking oil. Add the ground venison. Sprinkle with salt. Use your spatula to break it up into fairly large chunks. Resist the urge to stir, allowing a bit of browning of the meat instead of causing it to just turn grey. Flip the chunks after a few minutes, then set aside. When the barley is nearly done, stir in the venison and the bacon and simmer for 2-3 minutes. Store in the fridge overnight, or pour into a bread bowl and serve. Trenchers were two-day old (or four-day-old, depending on your source!) loaves of bread used as plates and serving dishes, and were found at the tables of both common folk and nobles in western and central Europe between the 12th and 16th centuries. There’s a really fascinating write-up on the history of trenchers here – warning, links to a .doc download, but I think it is worth the hassle! I was a little concerned my guests would be perturbed by stale bread, and it seemed like a bit of a waste of food, so I decided to go with a bread bowl instead. This was my first time experimenting with bread bowls, so I had some concerns about structural integrity. In the end, it turned out to be really straightforward. Buy or bake your loaf of bread. 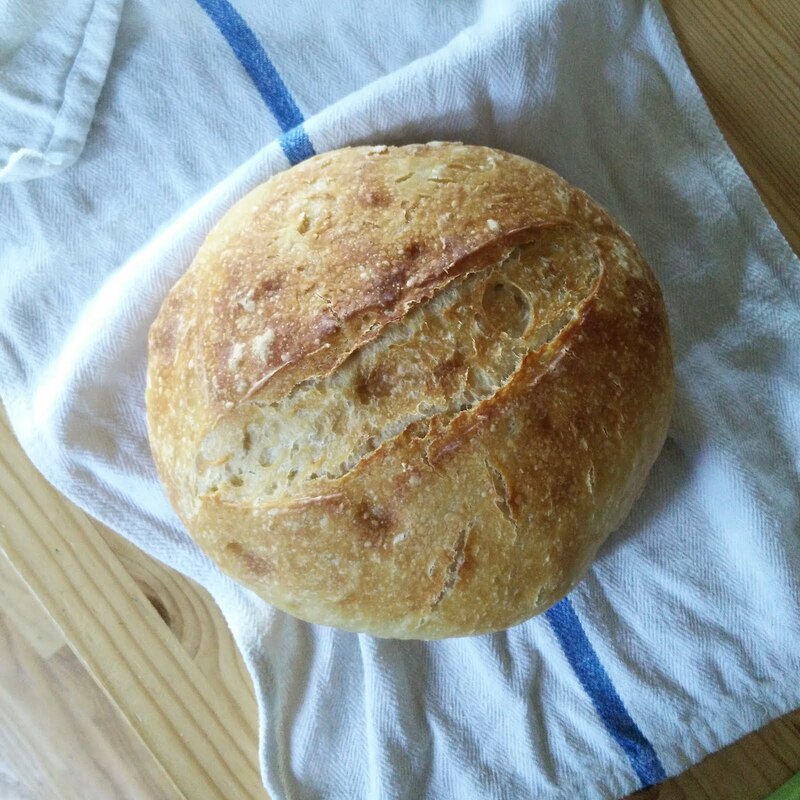 I used Cook’s Illustrated’s No-Knead Bread 2.0 recipe, which is very reliable and a good beginner’s intro to bread. Apparently, square trenchers were all the rage in the 15th century, but round was the original shape. Cut out a large circle from the top of the bread, and tear out. Use your fingers to tear off more pieces of bread from the center to create a sufficiently large hollow for your stew. Wrap, and store at room temperature until you are ready to serve. You could crisp it up in the oven before serving, but my oven was already packed with capon and an immense ham. I ended up using the carved-out bread for my stuffing recipe for the “capon stuffed with onions and mushroom” and the bread bowl part itself was all gobbled up. So we did our part to prevent food waste! A delicious recipe that can be easily made ahead. 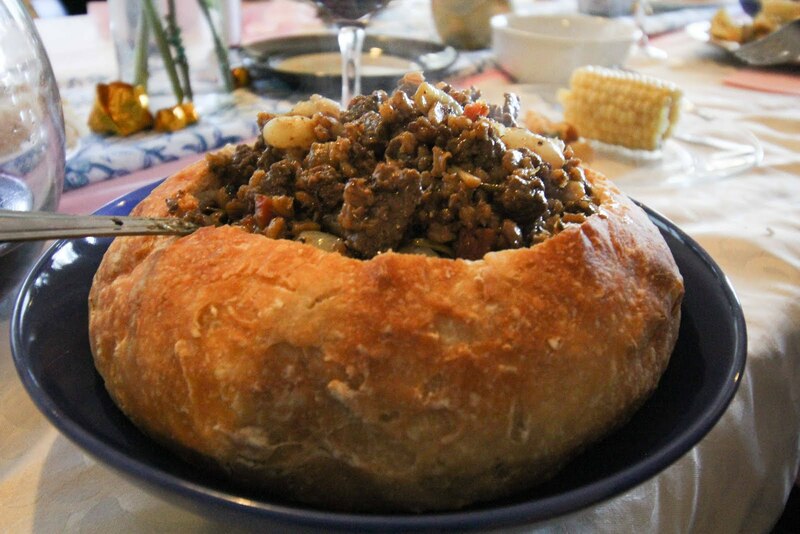 The bread bowl is a very straightforward way of making this dish look exciting. Modifications like store-bought loaves and frozen pearl onions would streamline this recipe with very little influence on taste. Really has that medieval atmosphere going for it. This was one of my favorite parts of the whole dinner, and I would certainly make it again!